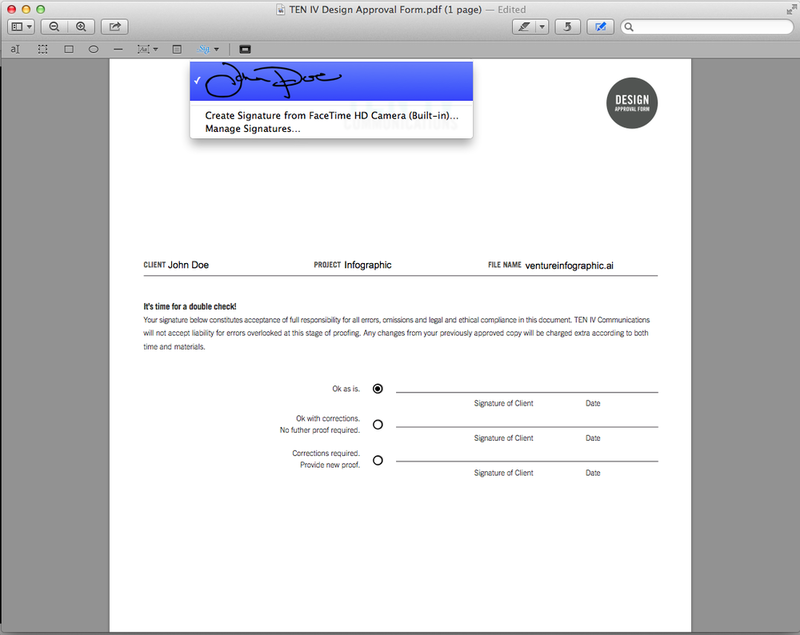 Creating and using a digital signature to sign a PDF! Forget about printing, signing and scanning, now you can sign your PDF forms digitally! Using Preview 5.x on a Mac you can now make signing a PDF quick and easy, here's a quick tutorial to help you get setup! 2. Click on the "Signature" menu and then click on the "Create Signature" button. 3. If a signature already exists, click on on the + to add a new signature. 4. Follow the instructions displayed onscreen and make sure that your signature fills the box on the left and sits on the blue baseline. When the signature preview looks correct, click Accept. 2. From the Signature pop-up menu, choose your signature. 3. Click the location where you want the signature to appear. If you click a line, Preview shrinks the signature, if necessary, to fit on it. 1. Click Show Edit Toolbar. 2. From the Signature pop-up menu, choose Manage Signatures. 3. Select the signature, and then click Delete (-). That's it! Now you can sign forms digitally without the hassle of printing, signing and scanning the documents.